This chapter is a synthesis of new knowledge, procedures, best practices and references for collecting plant diversity since the publication of the 1995 volume Collecting Plant Diversity; Technical Guidelines, edited by Luigi Guarino, V. Ramanatha Rao and Robert Reid, and published by CAB International on behalf of the International Plant Genetic Resources Institute (IPGRI) (now Bioversity International), the Food and Agriculture Organization of the United Nations (FAO), the World Conservation Union (IUCN) and the United Nations Environment Programme (UNEP). The original text for Chapter 24: Collecting In Vitro for Genetic Resources Conservation, authored by L. A. Withers, has been made available online courtesy of CABI. The 2011 update of the Technical Guidelines, edited by L. Guarino, V. Ramanatha Rao and E. Goldberg, has been made available courtesy of Bioversity International. Since this topic was reviewed in 1995, a technical bulletin as well as some additional reports using in vitro collecting (IVC) have been published, but the general needs and applications for IVC, as outlined in 1995, remain the same. When seeds or cuttings are not available to a collector or transport is not practical, tissues collected by in vitro methods can provide a valuable tool for obtaining and transporting germplasm. This has been especially useful for the collection of wild, endangered species for propagation for restoration and for tissue banking, particularly for species with recalcitrant seeds or for species making few or no seeds. IVC provides an additional tool for meeting the ex situ conservation and restoration goals of Target 8 of the Global Strategy for Plant Conservation. While some additional methods have been demonstrated for use in in vitro collecting (IVC), the basic approaches and principles described in 1995 are the same. IVC is a supplemental conservation tool for obtaining plant tissues of both crop and wild species for in vitro propagation and preservation. It is especially useful when seed collection is not possible or practical. A technical bulletin, edited by Pence et al. (2002a), provides updates on methods, as well as a number of case studies on crop and some wild species. A few further references since that time provide additional applications of this method, and although initially described for collecting germplasm from crop species and their wild relatives, the technique has been used to collect germplasm from wild endangered species as well (Pence, unpublished data; Pence and Charls 2003; Pence et al. 2009; Trusty et al. 2009). Trials on wild rainforest species have also been reported (Pence, 2005). In all cases, the fundamentals of IVC, as described in 1995, have remained unchanged, including its most prominent characteristic: its flexibility. In terms of endangered species, IVC remains a valuable part of the conservation toolkit. When courier services are available, rapid and reliable, it is generally more cost effective and equally successful to ship cuttings overnight from the field to the laboratory than to collect by IVC. However, if such service is not readily available, IVC can be used to help maintain viability of the tissue in transit. Also, if the collector is an in vitro specialist and needs to remain in the field for further collections, IVC can be useful for holding the tissue, either in the field or after it is sent back to the laboratory, until the collector/tissue culturist can return to the lab to work with it more fully. One of the first uses of IVC for collecting endangered species was in the U.S. in 1998, for the collection of two rare wetland species: Lobelia boykinii and Rhexia aristosa. Staff from the labs of the Cincinnati Zoo & Botanical Garden’s Center for Conservation and Research of Endangered Wildlife (CREW) invested significant time and resources to conduct a trip to the site of the plants in North Carolina, with the goal of collecting seed from which to initiate in vitro cultures for propagation. In collaboration with local field experts, the timing of the trip was determined to correspond to the production of seed, but due to weather and other variables, when the site was reached, the seed had already been dispersed into the surrounding water. However, tools for IVC had also been brought to the site, and shoot tips were removed from several genotypes of each species and cultured in small vials of medium. These were brought back to the laboratory, where they were used successfully to initiate cultures, tissues from which were ultimately banked in long-term liquid nitrogen storage in CREW’s CryoBioBank (Clark and Pence 1999 and unpublished). This provided an example of the use of IVC when seeds are not available at the time of collecting. Rare species are often in remote areas, and despite the best information available, the timing of the collecting expedition might not coincide with the availability of seeds. Additionally, unexpected species that are of interest but for which seeds are not available might be encountered during an expedition. Having the option of utilizing IVC methods in these circumstances can maximize the time and resources invested in an expedition. Recalcitrant seeds, because of their sensitivity to desiccation and often short viability, pose challenges for collecting that are similar to vegetative tissues. If courier services or overnight transport is not available or practical, IVC methods for the seed or embryo can be utilized or vegetative materials can be collected as a back-up to seed material (Berjak and Pammenter 2003). Even when courier service is available, IVC can be useful for collecting multiple genotypes that must be collected over the course of several days at several sites, decreasing the cost associated with multiple shipments of material. It has been utilized in this way for collecting multiple genotypes of the endangered species, Asimina tetramera, from Florida, in the USA. A. tetramera has recalcitrant seeds, and CREW has worked with collaborators in Florida to collect multiple genotypes for tissue cryopreservation. These have been collected from multiple sites over the course of several days using IVC, resulting in tissue lines that are being used for producing plants for restoration, as well as for tissues for cryopreservation (Pence and Charls 2003). One of the crop species for which IVC is routinely used is coconut. This is especially the case in the framework of a research project entitled “Validation of a Coconut Embryo Culture Protocol for the International Exchange of Germplasm”, which is funded by the Global Crop Diversity Trust and coordinated by Bioversity International. The project includes coconut research institutes in Brazil, Côte d’Ivoire, Sri Lanka, the Philippines and Papua New Guinea (http://ongoing-research.cgiar.org/factsheets/validation-of-a-coconut-embryo-culture-protocol-for-the-international-exchange-of-germplasm). No new protocols have been published; participants have improved, refined or adapted the existing protocols described in the 1995 version of this chapter to their own needs. Contamination of initial explants is a challenge for IVC, and its extent will depend upon the species, tissue, environmental conditions and location of the parent plant. A review of some of the approaches to prevent contamination is included in the IPGRI Technical Bulletin (Pence and Sandoval 2002). 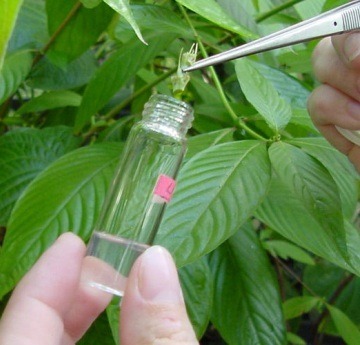 Tests of antimicrobial agents on non-endangered, wild rainforest species collected in the open air have indicated the usefulness of such methods (Pence 2005). It is particularly helpful if methods can be tailored to specific, targeted species, as was done in developing IVC methods for species of Eucalyptus (Watt et al. 2003). This study showed that methods developed on greenhouse and garden-grown plants could be transferred to species growing in the wild and could provide useful models for developing methods for other species identified as candidates for IVC. The success of IVC is dependent on the availability of workable methods of in vitro culture for any particular species. Less than optimal methods for species that are recalcitrant to culture limit the application of all in vitro methods to these species, including IVC. Thus, improvements in the application of tissue-culture methods to a wider range of species will benefit IVC, as well. In addition, although methods for controlling contamination are successful in the majority of cases, improvements in antimicrobial methods should also serve to broaden the applicability of IVC. Despite its potential, IVC may be viewed as being underutilized as a tool for ex situ plant conservation. There may be several contributing factors to this: first, IVC is largely a method for transport. In locations where overnight shipping services are available and reliable, it might be cost-effective to utilize these in order to get the material to a laboratory as quickly as possible. There, the best methods of disinfestation and culture can be applied quickly, without the constraints that might limit those methods in the field. Much of the in vitro work with wild species has been reported from areas that have had such shipping services or where the distances did not preclude quick return to the laboratory. Much work with endangered wild species is done in-country, also reducing the distances needed for transport. In addition, the application of in vitro methods for ex situ conservation of wild species has been limited, compared with the use of in vitro methods for commercial applications. Increased efforts in this area are needed, in order to meet the ex situ conservation challenge of the Global Strategy for Plant Conservation. Although many species can be stored by seed banking, there is a subset of species that either have recalcitrant seeds or produce few or no seeds. These exceptional species often require in vitro methods for propagation or long-term ex situ storage by cryopreservation. IVC could play a significant role in assisting in transporting short-lived seeds, embryos, or tissues, thereby providing materials for in vitro propagation and preservation. Further research into the growth of tissues in vitro as well as into the technical aspects of IVC would help facilitate the application of these methods to wild endangered plant germplasm. In vitro collecting has proven to be a workable and useful tool for collecting plant material for in vitro propagation and ex situ conservation. The needs for IVC are generally unchanged, although the years since 1995 have seen its application broaden to a wider range of species, both cultivated and wild. As conservation efforts increase in the face of continued habitat loss, climate change and other factors, IVC will likely find wider application for collecting plant germplasm for food security and the long-term ex situ preservation of endangered species. Berjak P, Pammenter NW. 2003. Understanding and handling desiccation-sensitive seeds. In: Smith RD, Dickie JB, Linington SH, Pritchard HW, Probert RJ, editors. Seed Conservation: Turning Science into Practice. The Royal Botanic Gardens, Kew, Richmond, UK. pp. 415–430. Available online (accessed 4 October 2011): www.kew.org/msbp/scitech/publications/SCTSIP_digital_book/pdfs/Chapter_22.pdf. Brenes Hines A, Tapia VG, Velasco Urquizo E. 2002. Citrus. IPGRI Technical Bulletin 7:56–60. Background and methods for in vitro collection of Citrus germplasm. Clark JR, Pence VC. 1999. In vitro propagation of Lobelia boykinii, a rare wetland species. In Vitro Cellular & Developmental Biology 35:1105. Abstract of the in vitro work with this endangered species, including collection. Engelmann F. 2002. Coconut. IPGRI Technical Bulletin 7:68-71. Background and methods for in vitro collection of coconut germplasm. Krishnapillay B, Jayanthi N, Engelmann F. 2002. Tropical rainforest trees. IPGRI Technical Bulletin 7:72-75. Background and methods for in vitro collection of germplasm of tropical trees, focusing on Shorea leprosula. Montoya Henao LM, Tapia BC, Espadas y Gil FL, Sandoval JA. 2002. Musa. IPGRI Technical Bulletin 7:52-55. Background and methods for in vitro collection of Musa germplasm. Pence VC. 1996. In vitro collection (IVC). In: In Vitro Conservation of Plant Genetic Resources. Proceedings of the International Workshop in In Vitro Conservation of Plant Genetic Resources, 4–6 July 1995, Kuala Lumpur, Malaysia. An overview of the use of some antimicrobials in collecting from rainforest species. Pence VC. 1999. In vitro collection. In: Bowes BG, editor. A Colour Atlas of Plant Propagation and Conservation. Manson Publishing, London. pp. 87–96. A review. Pence VC. 2002. In vitro collecting—a tool for wild or endangered species conservation. IPGRI Technical Bulletin 7:26–29. The need for and application of in vitro collecting for conservation of wild species. Pence VC. 2002. In vitro collecting: response of leaf tissue from four sites to antibiotics and antioxidants. Poster presentation at the 10th IAPTC&B Congress, Plant Biotechnology 2002 and Beyond, Orlando, Florida, 23–28 June 2002. Collections done in four locations with different habitats (abstract). Pence VC. 2004. Contamination and growth in cultures of three endangered Florida pawpaws initiated by in vitro collecting. In Vitro Cellular & Developmental Biology 40:58A. IVC methods for collecting Asimina tetramera, Deeringothamnus pulchellus and D. rugelii (abstract). Pence VC. 2005. In vitro collecting (IVC). I. The effect of media and collection method on contamination in temperate and tropical collections. In Vitro Cellular & Developmental Biology – Plant 41:324–332. An evaluation of the effectiveness of the leaf punch and needle collection methods and of antimicrobial agents for IVC of tropical rainforest species. Pence VC, Charls SM. 2003. In vitro collecting and establishment of tissue culture lines of three endangered Florida pawpaws. In Vitro Cellular & Developmental Biology 39:19A. Using IVC to collect for the conservation of Asimina tetramera, Deeringothamnus pulchellus and D. rugelii (abstract). Pence VC, Sandoval JA. 2002. Controlling contamination during in vitro collecting. IPGRI Technical Bulletin 7:30–40. A review of methods and chemicals used for controlling contamination in collected tissues. Pence VC, Clark JR, Plair BL. 2002. Wild and endangered species. IPGRI Technical Bulletin 7:76–82. An overview of the methods used for in vitro collecting tissues from wild, endangered species with examples of US endangered species collected using IVC. Pence VC, Plair BL, Clark JR. 2000. In vitro collecting techniques for leaf and bud tissues. In Vitro Cellular & Developmental Biology 36:32A. Methods of IVC. Pence VC, Villalobos A VM, Sandoval JA. 2002. The future of in vitro collecting. IPGRI Technical Bulletin 7:84–86. A consideration of the future applications and needs for in vitro collecting. Pence VC, Sandoval JA, Villalobos A VM, Engelmann F, editors. 2002a. In Vitro Collecting Techniques for Germplasm Conservation. IPGRI Technical Bulletin No. 7. Available online (accessed 4 October 2011): http://cropgenebank.sgrp.cgiar.org/images/file/learning_space/technicalbulletin7.pdf. A handbook, outlining the general background and approach of in vitro collecting, as well as case studies of specific species. Pence VC, Charls SM, Plair BL, Jaskowiak MA, Winget GD, Cleveland LL. 2007. Integrating in vitro methods for propagating and preserving endangered species. In: Xu Z, Li J, Xue Y, Yang W, editors. Biotechnology and Sustainable Agriculture, 2006 and Beyond. Proceedings of the 11th IAPTC&B Congress, 13–18 August 2006, Beijing, China. Springer, Dordrecht, Netherlands. pp. 363–373. IVC as one of several in vitro tools for plant conservation. Pence VC, Winget GD, Lindsey KL, Plair BL, Charls SM. 2009. Propagation and cryopreservation of Todsen’s pennyroyal (Hedeoma todsenii) in vitro. Madrono 56:221–228. IVC used for collecting tissues of a rare species in the Lamiaceae from the south-western US. Plair BL, Pence VC. 2000. In vitro collection (IVC) as a tool for education. Annual Meeting of the American Society of Plant Physiologists, San Diego, California. Using IVC to teach about in vitro methods. Saldana HL, Oicate LM, Borbor Ponce MM, Calderon Diaz JH. 2002. Coffee. IPGRI Technical Bulletin 7:42–46. Background and methods for in vitro collection of coffee germplasm. Sandoval JA, Villalobos A VM. 2002. Avocado. IPGRI Technical Bulletin No. 7:61–64. Background and methods for in vitro collection of avocado germplasm. Silvanna Alvarenga V, de Bern Bianchetti L, Lopez Gonzalez PE, Sandoval OE, Zacher de Martinez MB. 2002. Cacao. IPGRI Technical Bulletin 7:47–51. Background and methods for in vitro collection of cacao germplasm. Taylor M. 2002. Taro. IPGRI Technical Bulletin No. 7:65–67. Background and methods for in vitro collection of taro germplasm. Trusty JL, Miller I, Pence VC, Plair BL, Boyd RS, Goertzen LR. 2009. Ex situ conservation of the federally endangered plant species Clematis socialis Kral (Ranunculaceae): a collaborative approach. Natural Areas Journal 29(4):376–384. IVC used to collect tissues from an endangered species from the southern United States. Watt MP, Berjak P, Makhathini A, Blakeway F. 2003. In vitro field collection techniques for Eucalyptus micropropagation. Plant Cell, Tissue & Organ Culture 75:233–240. An account of experiments to develop a workable procedure for IVC for Eucalyptus. Withers LA. 2002. In vitro collecting—Concept and background. IPGRI Technical Bulletin No. 7:16–25. A history and introduction to in vitro collecting.